Valentine’s Day is almost here and there is no doubt that most couples are already looking into ways to make this day special. Valentine’s Day is supposed to be a celebration of love. It’s that time of the year when you do something special for your loved one and let them know what they mean to you. It’s also that time of the year when you get creative for the sake of love. In case you are thinking of surprising your better half this Valentine’s Day, there is nothing better than to prepare their favorite food. But instead of the usual, you can add a Valentine’s Day theme by making sure the food is shaped like a heart. This will surely send the message and in fact, here is a list of the best heart-shaped foods you can make this Valentine’s Day. Is there anyone out there who doesn’t love to wake up to bacon? Well, we personally love it and you can rest assured that even on Valentine’s Day, bacon will be on the menu. 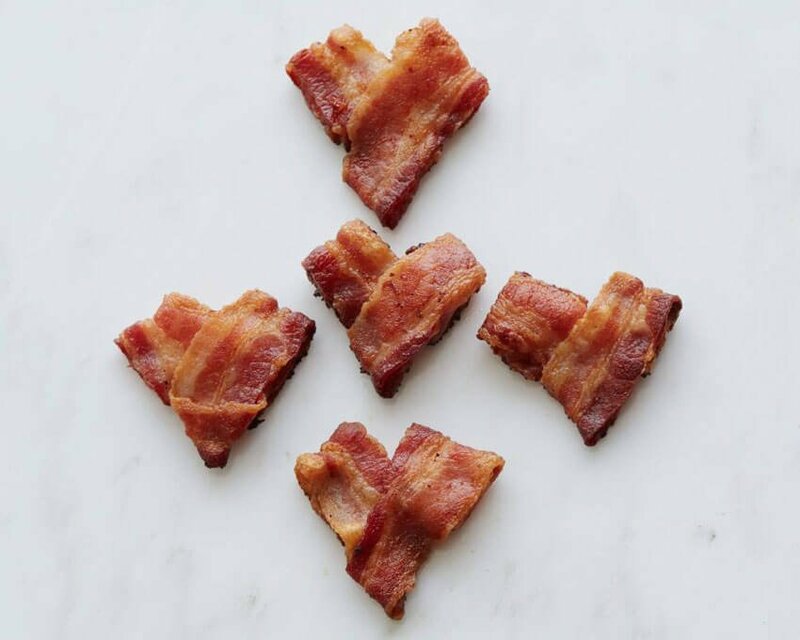 You can start off your loved one’s day with an exciting heart-shaped bacon breakfast and set the foundation for the passion and romance that is still yet to come for the rest of the day. Making Oreo hearts might be a little bit challenging but it’s something that can be done. All you need is to buy a few Oreo cakesters and use a cookie cutter to get the heart shape. The brown and inviting color will go very well with the Valentine’s Day theme. Besides, Oreos are a big favorite for many people. Making little hearts and serving your loved one will be quite special. It won’t take you long to prepare, but it’s a memory that will be remembered for a very long time by your special better half. This is another breakfast delight that will surely set the passion for the rest of the day. Heart-shaped pancakes are definitely a great choice for Valentine’s Day. And it’s not just about the heart shape. You can use red velvet cake flavor to add to the magic. Can you imagine it? Heart-shaped pancakes for breakfast? Can it get any better than that? Let’s take you back to another basic idea that is still magical. Everybody can bake a cake, right? Well, this Valentine’s Day, make it special by ensuring the cake is shaped like a heart. Use red flavor and sprinkles of white to give it that breathtaking romantic look. And don’t forget to make it tasty too. This would be the perfect dessert after a long day of fun and love. Making a heart-shaped cheesecake will take time but it will be worth it. If you can start this a day before Valentine’s Day, it will be great. You can, however, bake that very morning and have the cheesecake ready for dessert after dinner. Write a special message on the cake if you want but even on its own, the cheesecake will be magical. Finally, show your better half how much you love them by making a strawberry cupcake. It’s very easy. Simply make an ordinary cupcake. Find a strawberry, cut it in half to make a heart shape and place it on top of the cake. Food during Valentine’s Day is important and it can be a great way to showcase romance and love to the person that you love. The ideas above will definitely blow anyone away. They are also very simple and easy to try at home. Which of these delicious heart-shaped treats are you going to make for Valentine’s Day? Let us know in the comments below!